We searched high and low for a truly amazing Wedding singer, and Louise was the one we both fell in love with! It was one of the most important things for us to get right, as it can add so much to a Ceremony. Louise was fantastic to deal with beforehand, answering any questions we had regarding song placement and giving us ideas. She very kindly learned a special song for us, and I'll never forget my Husband whispering to me during the Ceremony "wait till you hear her sing our song!" - he had heard her rehearsing it before I arrived. Our guests all thought she had a beautiful voice, and she was perfectly accompanied by musicians that she had recommended to us.Thank you Louise for adding so much to our Wedding Ceremony. Louise sang at our wedding in June and was phenomenal! Such a clear, sweet voice. It sent shivers down my spine. Each song was fantastic and felt so personal. She really made the mass feel very special. All my guests thought she was phenomenal. She is delightful to deal with, sent me lovely song recommendations and everything was sorted out via email. I couldn't recommend her highly enough! Louise played for our wedding in Dec 07. It was such a magical performance that added so much to our wedding mass. Louise learned a song that i wanted once i provided the sheet music, again adding so much to the whole thing. It helped to make our day the fantastic day that it was. Everyone complimented you afterwards. Well done, and thank you again!! We booked Louise for our wedding last year, and i have to say she was brillent. I found her while searching for singers online. She sent a demo tape to us and sounded perfect. She was a great help to us also arranging the songs for the service. One of the songs we picked for the service really didnt suit a soprano singer but we really wanted it, Louise was so accomodating and sang the song and sounded unbelievable. All my guests commented on her singing and said she was fantastic. I have and will continue to recommend her. The service is the most important part of the day and she just made it extra special. Our wedding day was an unforgetable day what made it even more unforgetable was our fabulous wedding singer Louise Harrison. She truely has an amazing voice and many of our guests commented on same. 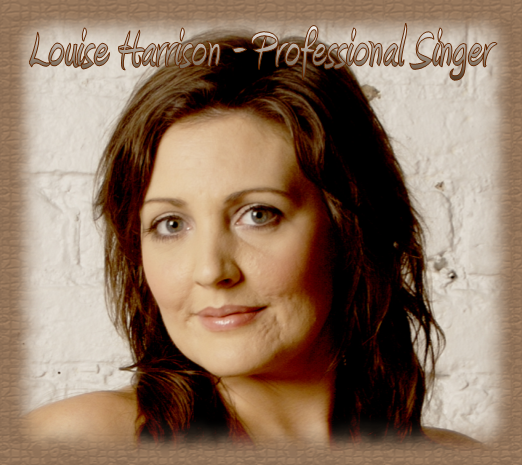 Louise was an absolute pleasure to deal with and gave us her advice and guidance when choosing our songs. We would certainly recommend Louise to anyone considering her for their special day.